Home › Sociology › gender & feminism › It’s nearly Carnival time! This edition will be hosted by Deborah at The Hand Mirror. 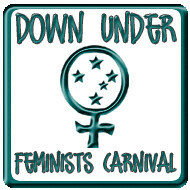 Submit your January posts, or those of others, by an Australian or New Zealander feminist at blogcarnival. If you can’t access the blogcarnival captcha, you can email submissions this month to dfr141 at that hotmail place.